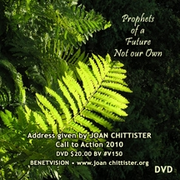 Closing keynote address given by Joan Chittister at Call to Action's 2010 National Conference. This is Joan's powerful challenge to act now for the future. Also available as CD, Click here.